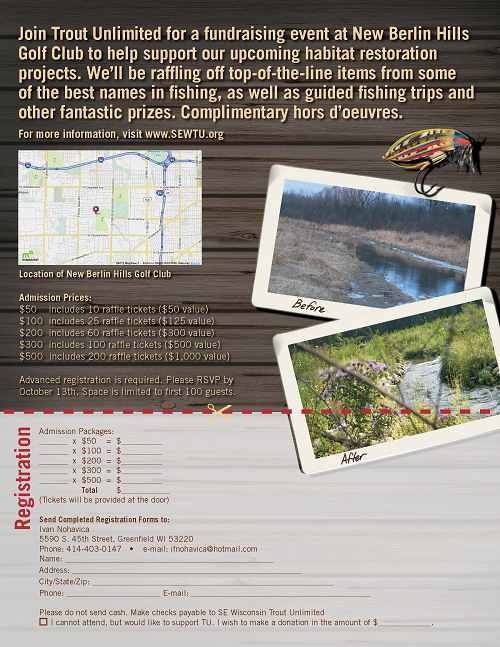 Join Trout Unlimited for a fundraising event at New Berlin Hills Golf Club to help support our upcoming habitat restoration projects. We’ll be raffling off top-of-the-line items from some of the best names in fishing, as well as guided fishing trips and other fantastic prizes. Complimentary hors d’oeuvres. October 13th. Space is limited to first 100 guests. You can also get the form at our Facebook page.